Little Common Football Club heads into the final weekend of February within sight of securing a promotion place. The long-time Macron Store Southern Combination League Division One leaders need five points from their remaining seven matches to guarantee a top three finish. Already sure of a top four finish, Eldridge’s side is seven points clear of second-placed Langney Wanderers having played an extra game. Common have won 23 of their first 27 league matches, scoring a massive 91 goals and conceding only 26. “The boys have shown amazing consistency throughout the season, and workrate and desire to achieve at certain points when things haven’t gone our way and we’ve had to dig in and show different sides to us,” continued Eldridge. Common made it 13 wins in 14 home league fixtures this term with a 2-0 victory against Midhurst & Easebourne last weekend. “It was a bit of a tricky tie,” Eldridge went on. “We were expecting a tough game as they were off the back of some good form. It wasn’t a great game, it was a little bit niggly. It was a case of getting the job done and that’s what we did again. “Teams aren’t going to make it easy for us so credit to the boys for getting the win that we wanted and we’re more than happy with that. “We scored an early goal and I thought we would kick on, but it never really materialised. First half we struggled a bit, we didn’t really get any momentum or ball retention and we didn’t really get going. “They were probably on top without really creating too much. We had to work a bit harder than maybe we would’ve liked to have done, especially having gone a goal up. We didn’t really do a great deal apart from the goal. Common will turn their attention to the Division One Challenge Cup today (Saturday) and a quarter-final at home to Selsey. Kick-off is 3pm. 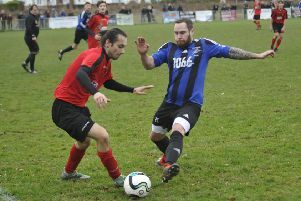 The Commoners won both league meetings with eighth-placed Selsey, including a 4-1 victory at The Oval just four weeks ago. “We’ll have to make sure we take full advantage of the fact that we’re at home,” added Eldridge. “It’s a one-off game and I guess there’s a different feel to this game with it being in the cup. We want to do well in this cup; we’ve not done well enough in the past. “We really want to do what we can to get through to the semi-final and they will come to us with the same thoughts. James Maynard and Jamie Crone are unavailable, but Louis Walker should be fully fit, and Harry Saville and Sam Winter are expected to return following illness.